Investcorp backed Ceme Spa was founded 40 years ago and is a provider of fluid control components serving the coffee, steam, industrial, and beverage end markets. They were seeking to appoint a Non-Executive Director to help them grow the business internationally as they expand into the US, and across new markets, specifically beverage, sanitary and other industrial niches. Through Nurole they identified Andrew Hosty, the Chief Executive of the Royce who previously worked for FTSE 250 Morgan Advanced Materials Plc, where he was Chief Operating Officer. A Fellow of the Royal Academy of Engineering and the Institute of Materials, Minerals and Mining, Andrew has more than 25 years’ experience of the commercial sector with main board experience of FTSE 250, SmallCap and private businesses and has worked at all stages of business growth and economic cycles. 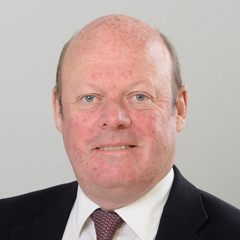 Andrew currently serves as a Non-Executive Director at Consort Medical Plc. "The application process was straightforward and efficient." Membership of Nurole is by invitation only. You can ask an existing member to recommend you or you can request an invitation by clicking the button below. Nurole can work either with you and your team or a traditional headhunter. Contact us today to discuss how we can help you find the perfect candidate.